Let? ?в„ўs see how Intel? ?в„ўs shift to 65nm Presler core has affected the youngest dual-core Intel processors. This article offers you a detailed study of the performance and overclocking potential of the new Pentium D processors. Maybe it is high time we started expressing more excitement about dual-core Intel CPUs? Of course, products like that are not for the mass market and are very unlikely to become the sales leaders because of that. Only dedicated hardware enthusiasts will go for them. So sooner or later we had to turn to more ???mass??? solutions from the dual-core Pentium D product family on Presler core. Especially, since they have been significantly improved. They acquired larger L2 cache than the predecessors based on the older Smithfield core. And if the slower Pentium D models could be regarded as competitors to AMD Athlon 64 X2 only thanks to their lower price, now the situation has every chance to change. It is important that Intel decided to change the processor core of its dual-core CPUs without raising the price of the processors. According to the official price-list, the slower Pentium D models on the new core sell at exactly the same price as their predecessors based on the older 90nm core. It means that Intel has acquired a new weapon in the mainstream market segment that can help the company to win back some of the market from AMD Athlon 64 X2. On the one hand the new younger Pentium D processors cost considerably less than the best value dual-core competitor CPU ? ?вЂњ Athlon 64 X2 3800+. First of all I would like to take a look at the price-list. In order to better understand the correct disposition of the Athlon 64 X2 and Pentium D in the today? ?в„ўs market, we need to check out their prices. 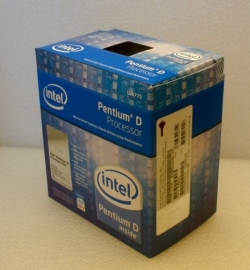 The official price of the youngest Presler based CPU, Pentium D 920, is $241. Pentium D 930 is priced at $316. The least expensive competitor? 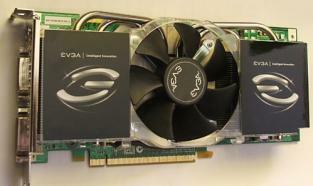 ?в„ўs dual-core solution, AMD Athlon 64 X2 3800+, sells at $301. It means that this processor is most likely to be a direct competitor to Pentium D 930. As for Pentium D 920, it is the today? ?в„ўs cheapest dual-core desktop processor. Moreover, in the second half of April Intel is planning o lowering the prices of its dual-core CPUs. After that both, Pentium D 920 and Pentium D 930, will drop down to $209. No doubt that AMD will respond to this measure with an inevitable price reduction for its Athlon 64 X2. However, we still believe that Intel will retain the title of the manufacturer of the world? ?в„ўs most affordable dual-core processors. These processors feature SL94S and SL94R S-Spec. These are the today? ?в„ўs only models available until Intel starts shipping CPUs with Presler C1 core stepping. This should happen next month. 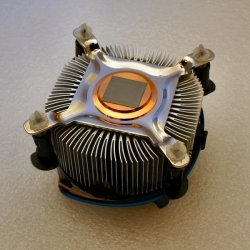 The launch of the new core stepping should also eliminate the major drawbacks of the B1 core stepping and reduce the heat dissipation of the top Pentium D models. As a result, Intel will be able to release faster models within the same family with the nominal clock rate reaching 3.6GHz. However, the slower Pentium D processor models will be the last ones to acquire the new C2 core stepping. As for the Pentium D 920, this buddy will never exist with the C1 core stepping at all. Among the distinguishing features of these processors we should definitely mention large L2 cache memory of 4MB total (2MB for each core). As you already know, dual-core Pentium D processors do not use the entire available L2 cache memory at once. At this time only the mobile Intel Core processors have shared L2 cache memory. Another peculiarity of the Pentium D processor is the absence of Hyper-Threading support. Although it is theoretically implemented in the Presler core, it is truly activated only in extremely expensive Pentium Extreme Edition CPUs. However, Pentium D 920 and Pentium D 930 fully support x86-64 64-bit extensions and Virtualization Technology. I would like to specifically point out that Presler processors on B1 core stepping do not support Intel Enhanced SpeedStep technology. At the same time, these processors do not support the entire Demand Based Switching set, i.e. Enhanced HALT State and Thermal Monitor 2. Although the minimal multiplier Presler processors theoretically support equals 12x, power saving technologies will only be implemented in the C1 core stepping. As we can see, the two processors we have at our disposal support slightly different nominal Vcore. Pentium D 920 worked at 1.3V Vcore, while the nominal voltage for Pentium D 930 equaled 1.35V. Besides the actual CPU, the box also contains a traditional cooler that now has a massive copper center, and is not very tall. However, this is more than enough to properly cool down the youngest Pentium D models based on 65nm core. Among other peculiarities of this cooler we should also mention relatively low level of generated noise and extremely inconvenient retention mechanism. So, we wouldn? ?в„ўt pin too many hopes upon it, to be honest. Low price is not the only attraction of the youngest CPU models. These solutions are usually very popular among overclockers, because they boast the highest frequency gain that can be obtained during overclocking. So, we couldn? ?в„ўt disregard this important matter and paid due attention to overclocking experiments with these CPUs. The test platform we assembled for our overclocking session was built around ASUS P5WD2-E Premium mainboard. The memory subsystem consisted of two Corsair CM2X1024-6400PRO memory modules. 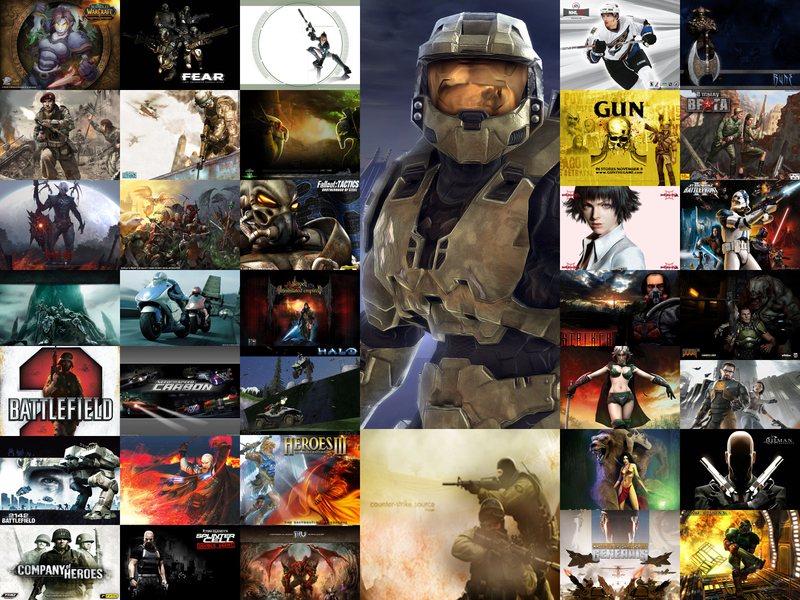 Besides that the platform features NVIDIA GeForce 7800 GTX 512MB graphics card and Western Digital WD740GD HDD. We decided to replace the boxed cooler with the more efficient Zalman CNPS9500 LED. First of all I would like to make a few general comments about the overclocking of any Pentium D processors on Presler core. Just like their predecessors on the 90nm core, the new Pentium D processors feature a locked clock frequency multiplier. It means that these CPUs should be overclocked by raising the FSB bus frequency. In other words, the overclocker? ?в„ўs system should feature a very high-quality mainboard that will allow significant increase in the FSB frequency without threatening the system stability. Another important thing that we revealed during our experiments, is the serious dependence of the Pentium D (Presler) overclocking potential on the Vcore. Higher Vcore could only slightly expand the processor? ?в„ўs supported frequency range in case of Intel processors with 90nm cores. However, now that we have moved to 65nm Presler, the situation has become totally different. This core appears very sensitive to Vcore increase. 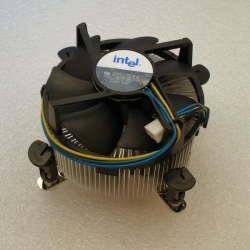 As a result, Pentium D overclocking with the help of specific cooling solutions such as phase cooling or water cooling could be very efficient, because it would allow increasing the processor Vcore quite significantly. For example, the results obtained by the best overclockers out there show that Presler can go as high as 5.5-6GHz on the core. As for us, we are not going to deal with any high-tech cooling devices. We are just going to see, how far we could go with a mass air-cooler. Of course, the maximum working frequencies of the Presler based processors will be much lower in this case. For instance, when we overclocked a Pentium Extreme Edition on this core, we managed to reach 4.26GHz with the air cooling system installed. To be honest, we expected to see something similar today with our Pentium D 920 and Pentium D 930 processors. The first one to go was Pentium D 920 CPU. The maximum GSB frequency when the CPU could work stably without raising the Vcore equaled 268MHz. In other words, at the nominal core voltage this processor could work at the frequency slightly higher than the nominal: 3.75GHz. However, as we have already mentioned above, the increase in Preselr? 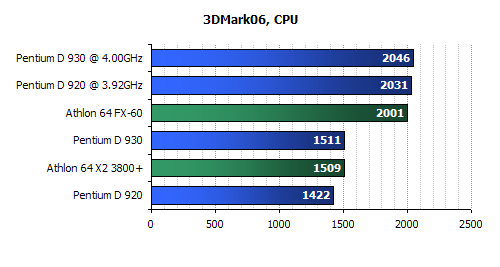 ?в„ўs Vcore pushes its overclocking potential up enormously. So, all our further experiments were conducted with the processor Vcore increased to 1.45V. We could actually raise the Vcore even more in order to obtain more impressive results, however, we couldn? ?в„ўt risk losing the CPU, so we didn? ?в„ўt go any further. Especially, since we did not have any statistics about the safe operation of Pentium D with the greatly increased Vcore. 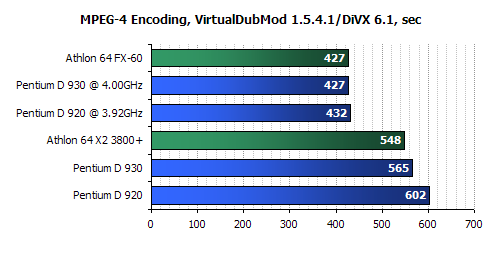 However, even with this modest Vcore increase we could significantly improve our overclocking results. The CPU worked stably at up to 280MHz FSB frequencies. 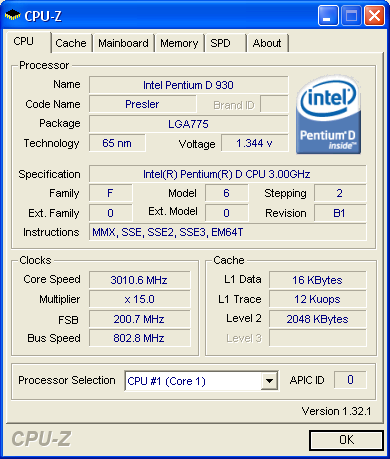 So, the Pentium D 920 test sample overclocked by about 40% above the nominal and ran stably at 3.92MHz. Of course, this is not the world? ?в„ўs record, but it is quite a good result, anyway. At least this value is a way higher than the nominal clock frequency of the top Pentium D processors, which is very pleasing already. After our experiments with the Pentium D 920, it was the turn of the Pentium D 930 fellow. Without any Vcore changes this processor could work stably at 258MHz FSB, i.e. at 3.87GHz clock speed. However, this is just a preliminary result. As we have expected, the increase in the processor Vcore pushed the overclocking results even higher. Since the nominal core voltage of this processor is slightly higher than that of the 920 model we have just overclocked, we took our chances in raising the Vcore a little bit more, up to 1.475V. 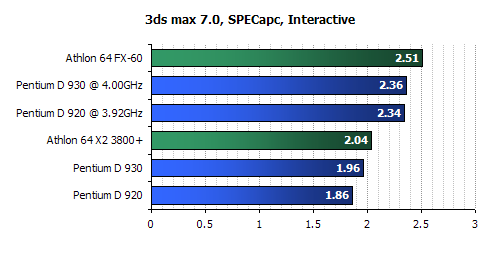 After that our Pentium D 930 CPU could boast absolutely stable operation at up to 267MHz DSB frequency. As a result, the maximum frequency we managed to reach during Our Pentium D 930 overclocking experiment was 4.0GHz. In absolute values, it is more than during Pentium D 920 overclocking, but in relative values it makes only 33%. So, it looks like the Presler processors boast much higher overclocking potential than their counterparts on the Smithfield core, and can easily reach frequencies up to 4.0GHz thus outperforming even the top-of-the-line Pentium D CPUs working at their nominal speed. 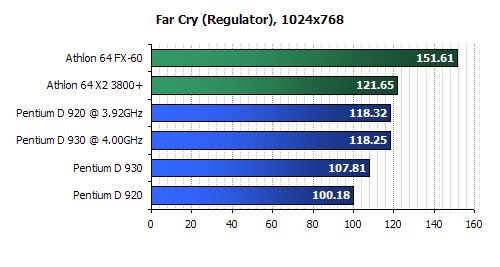 However, will this overclocking be enough for Pentium D 920 and Pentium D 930 to outperform the top dual-core AMD CPUs? This is the question we will try to answer later in this article. As for the working conditions for the overclocked Pentium D processors, we have to stress that they are quite acceptable. The CPU temperature when they were topped with Zalman CNPS9500 LED cooler was close to 70o C, and the system proved stable in all widely spread benchmarks that were completed without thermal throttling activated. During our test session for the Pentium D 920 and Pentium D 930 we tried to attain two goals. Firstly, we had to find out how fast the best-value dual-core Intel processors could be compared with the youngest AMD Athlon 64 X2 3800+. Secondly, we wanted to see how fast the overclocked Pentium D 920 and Pentium D 930 could go. In this case we decided to compare the per5formance of our today? ?в„ўs heroes against that of the today? 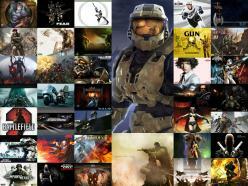 ?в„ўs fastest dual-core AMD Athlon 64 FX-60 processor. Note that since the youngest dual-core AMD processors with two cores overclock up to 2.6GHz on average, the performance level demonstrated by Athlon 64 FX-60 can easily be regarded as the performance of the overclocked Athlon 64 X2. In other words, by comparing the overclocked Pentium D 920 and Pentium D 930 processors against Athlon 64 FX-60 we could actually answer the question: what dual-core CPUs boast best performance results during overclocking. 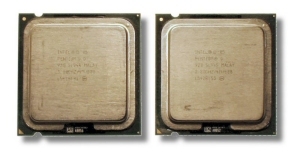 Intel Pentium D 920 (LGA775, 2.8GHz, 2x2MB L2, Presler). ASUS P5WD2-E Premium (LGA775, Intel 975X Express). 2048MB DDR2-667 SDRAM (Corsair CM2X1024-6400PRO, 2 x 1024 MB, 4-4-4-12). Graphics card: NVIDIA GeForce 7800 GTX 512MB (PCI-E x16). 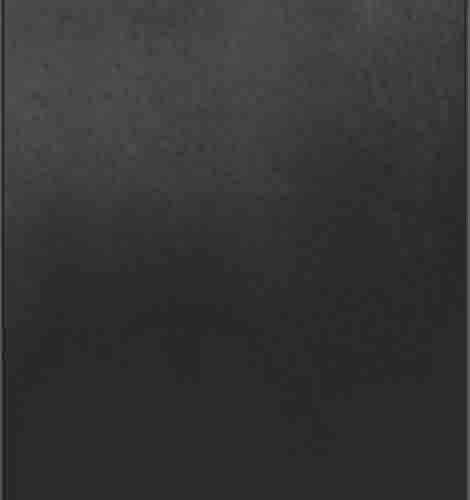 HDD: Maxtor MaXLine III 250GB (SATA150). OS: Microsoft Windows XP SP2 with DirectX 9.0c. The tests were run with the BIOS settings adjusted for the maximum performance. First of all we decided to test the performance of our processors in popular synthetic benchmarks. Although PCMark05 is not a very objective test, it is still quite popular. The results we obtain here rank the CPUs according to their price point. 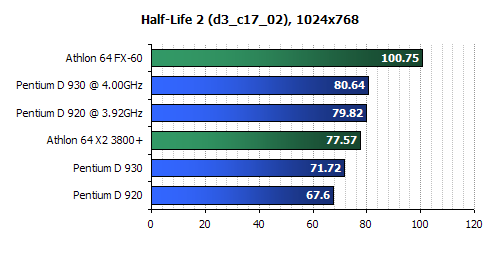 The performance of Athlon 64 X2 3800+ appears right between the results obtained on Pentium D 920 and Pentium D 930. However, the performance of Intel? 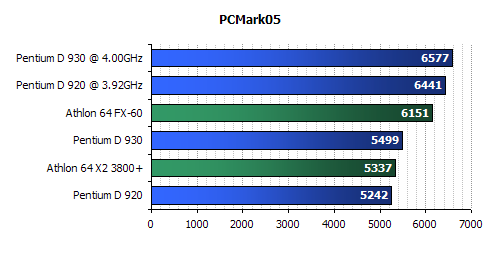 ?в„ўs overclocked dual-core fellows has an impressive influence on PCMark05 results. 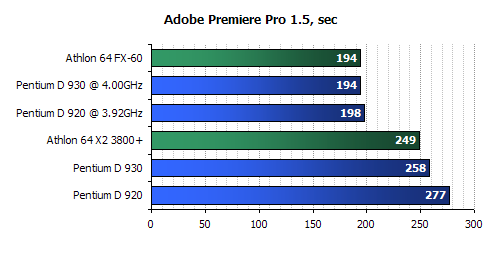 Presler based CPUs working at 4.0GHz frequency leave AMD Athlon 64 FX-60 behind in no time. 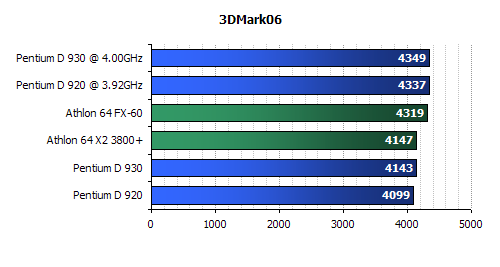 3DMark06 results are very similar to what we have just seen on the previous diagram. At least when it comes to overclocked processors? ?в„ў performance. As for the results obtained in the nominal mode, Athlon 64 X2 3800+ manages to catch up with Pentium D 930 here. In other words, 3DMark06 puts the youngest AMD Athlon 64 X2 processor in a better position compared to the first Pentium D models from the price-to-performance point of view. The same conclusion can be drawn from the CPU benchmark from the same testing suite. Once again the overclocked Pentium D CPUs leave Athlon 64 FX-60 behind. However, when it comes to the nominal speeds, the results are no longer that impressive. The competitor solutions based on K8 architecture are definitely faster than the rivals in scientific computational tasks. 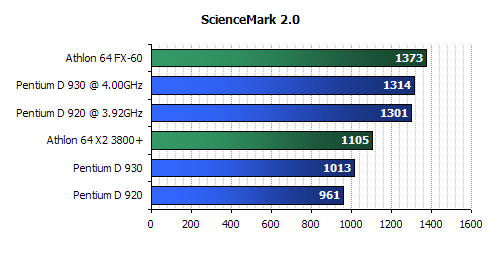 According to ScienceMark 2.0, the performance of Athlon 64 X2 3800+ is higher than that of Pentium D 920 and Pentium D 930. Overclocking also doesn? ?в„ўt help Intel processors to catch up with Athlon 64 FX-60. The situation is the same in all test applications we used to reveal the CPU performance during video and audio encoding. 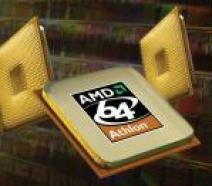 The youngest dual-core AMD processor, Athlon 64 X2 3800+, appears faster than the youngest Pentium D CPUs. Even overclocking doesn? ?в„ўt help Intel processors. Athlon 64 FX-60 working at 2.6GHz easily withstands the Pentium D Presler CPUs running at up to 4.0GHz speeds. The results in Adobe Photoshop and Adobe Premiere make pretty much the same picture as in the previous case: the results are not in Intel? ?в„ўs favor. The youngest dual-core AMD processor once again demonstrates better price-to-performance ratio. As for the overclocked Pentium D CPUs, they do show a pretty significant performance boost, but fail to outperform the rivals. They appear slower than Athlon 64 FX-60 working at 2.6GHz, and hence will be slower than any dual-core AMD processors overclocked to the same level. The situation in 3ds max can be considered pretty common already. Just as in all other ???heavy??? tasks, Athlon 64 X2 3800+ is faster than Pentium D 920 and Pentium D 930. even the overclocking to 4.0GHz doesn? ?в„ўt help these processors to defeat Athlon 64 FX-60. Frankly speaking, we didn? ?в„ўt even hope that Pentium D processors would win here. K8 architecture proves much more efficient in tasks of this kind than Intel? ?в„ўs NetBurst. As a result, the youngest Athlon 64 X2 manages to show better performance than even the Pentium D processor overclocked to 4.0GHz (in FarCry, for instance). The youngest Pentium D processors based on the new Presler core didn? ?в„ўt prove up to our expectations. Despite the improvements introduced by the manufacturer such as larger L2 cache, they are still unable to successfully compete against the rivals from the same price group in the majority of tasks. In fact, Pentium D 920 and Pentium D 930 can only prove faster than Athlon 64 X2 3800+ (the youngest dual-core processor from AMD) in office applications and selected synthetic benchmarks. That is why the only way Pentium D can become popular is due to its $60 lower price than that of Athlon 64 X2 3800+. From all other standpoint, it may not be the best purchasing decision to make at this time. Unfortunately, the great overclocking potential allowing to speed these processors up to 4.0GHz can also hardly become a convincing argument in their favor. 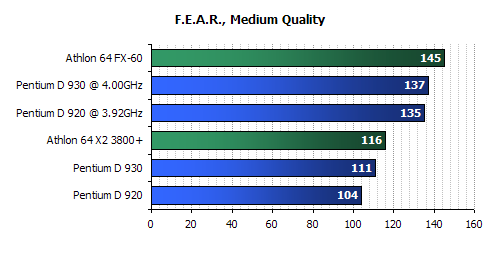 According to our tests, Presler based CPUs working at 4.0GHz cannot outperform Athlon 64 FX-60 working at 2.6GHz only. As a result, we have every right to claim that the overclocked Athlon 64 X2 will be mostly faster than the Presler based overclocked Pentium D processors. However, summing up the results of our today? ?в„ўs test session we should also point out a few advantages of the CPUs on the new 65nm Presler core, compared with the predecessors on the 90nm Smithfield core. If we compare Pentium D processors working bat the same clock speed but belonging to the 800 and 900 series side by side, we will immediately notice the whole lot of advantages of the newer family. It is certainly the much lower heat dissipation, higher performance resulting from the larger L2 cache and higher frequency potential. Quite an impressive set of features, don? ?в„ўt you think so? It is, but it proved to be not enough for the CPUs to successfully compete against their eternal rivals. So, Intel fans will have to wait until September, when the new dual-core processors based on the absolutely new Core (Conroe) architecture will arrive. 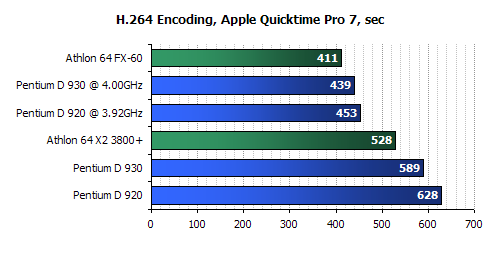 According to the preliminary performance results, they will be at least capable of competing with Athlon 64 X2. And in the meanwhile, Intel processors can not really win the market, for quite a few objective reasons we have just discussed.